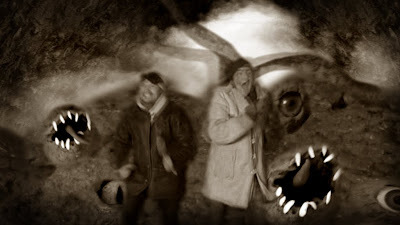 I recently helped my filmmaking buddy Daniel Lenneer put together an animated Shoggoth for his non-epic version of H P Lovecraft's very epic "At the Mountains of Madness". You could say Danny's version is the ultimate example of the budget version of a mega-budget project. If you're going to make a condensed version of something too big to really pull off, this is probably the way to do it. 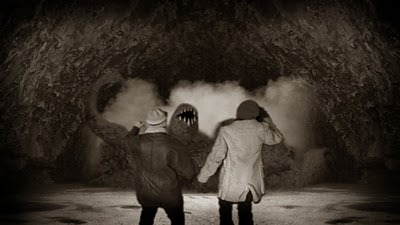 From what I've seen, his "The Terror From the Abyss" is turning out to be a very entertaining short film, especially if you know your Lovecraft. For those of you not that aquainted with Lovecraft's literary heritage, this is a quick sum-up of "At the Mountains of Madness": An expedition from Miskatonic University discovers the remains of an alien civilization in Antarctica and are eventually attacked by a sort of alien guarddog; a Shoggoth. Shoggoths are horrible masses of eyes, mouths and limbs, bred to fight for their masters, the Elder Things, but eventually rebelling against them. This is the dream project of filmmaker Guillermo del Toro, who has been trying to get it made for years. I hope he eventually does make it. He'd do the book great justice, I think. On to my version of the Shoggoth. 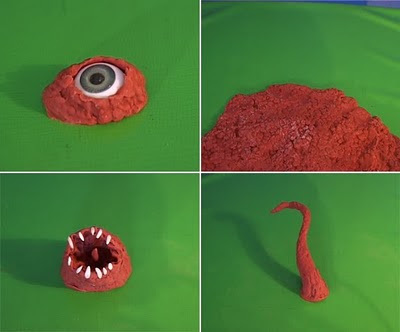 I thought it would be fun to do some really quick claymation to represent the monster, and since I'm such a lazy bugger I figured out a pretty easy way of pulling it off. Instead of animating a huge mass of clay, trying to keep check of what's moving where in what direction (I'll leave that to Harryhausen), I simply animated separate blobs of clay, morphing into different eyes, mouths and tentacles. These were then pieced together into a writhing mass in After Effects. Danny had already shot himself and his frequent partner in artistic crimes, Christopher, against a green screen in his basement. We added some smoke to represent churning snow. The Shoggoth comes out of a very dark cave..
..And then procedes to chase our heroes until it overcomes them and they turn into a Shoggoth snack. This is what the finished film will probably look like. There's been a fad in recent years of amateur-made silent film versions of Lovecraft tales. There are basically three reasons for this: Many of his stories were written in the silent film age (though not "At the Mountains of Madness"), as an amateur you don't have to worry about the sound, and it just seems to work very well for his stories. You can view more images from Danny's project HERE.